Melissa's Mochas, Mysteries and Meows: It's Mommy's Birthday!!! Please join me in wishing my Mommy a purr-fect birthday today! Happy birthday to your mommy!!! We hope you give her extra cuddles today! 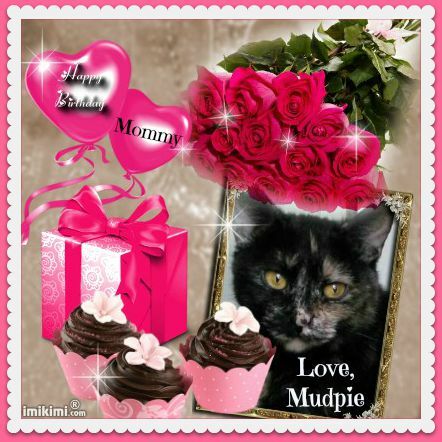 Happy birthday to your Mommy - you are the purrfect present Mudpie! We are wishing your Mommy the Happiest of Birthdays! Happy birthday! Mudpie, you did a great job on your card!! That is a pawsome card. Happy Birthday to Mudpie's Mommy—may your special day be everything bright and beautiful! Happy birthday to your human. We know you'll help her celebrate in style. Oh we sure wish that Mommy a very Happy Birthday today. Hope she has a fantastic day and many more. Take care. Happy Birthday, Melissa! May your day be filled with purrs and cuddles! Happy Birthday to your mom! We hope she has a wonderful day. Happy birthday, Melissa! Hope it's purr-fect! We would like to wish your Mommy a very Happy Birthday and hope she has some fun. Happy Birthday to Mudpie's Mommy! Happy Birthday to your Mommy. That is a beautiful card that you made for her. Happy Birthday to your mom. May her day be filled with love and joy. A very happy birthday Melissa! Happy Happy Birthday to your most PAWESOME MOMMY!!! We are hoping she is having a most beautiful and happy day!! Happy Birthday Melissa! Purrs from Piper! Aaaaaw Yous cawrd is just bootyful Happy Meowday awnty Melissa. We hope yous day is da bestest ever. mudpie.....a veree happee day two yur mom....we hope her getz lotz oh cat nip & cat grazz & sum treetz....& her sayz....oh, eye couldna possa blee eggs cept all thiz...& her RE GIFTS .....everee thing...two ewe !!! Happy Happy Joy Joyful Birthday!!! Happy Birthday to your Mom! You made her an adorable card. Happy Birthday, Mommy!!!! I hope you get the "blow out the candles" wish really soon, and that it is spectacular! Happy Birthday to you. Purr Purr Purr and many happy returns of purrs. Happy Birthday, Miss Melissa! We bet Mudpie gave you lots of kisses. Happy Birthday to Melissa, Mudpie's mommy!! That's a beautiful card, Mudpie! !